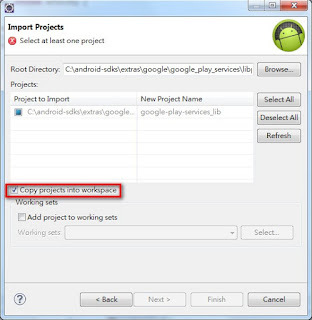 Select Browse..., enter /extras/google/google_play_services/libproject/google-play-services_lib, and click Finish. Select Browse..., enter /extras/google/google_play_services/samples/maps, and click Finish. Select Project > Properties, select Java Build Path, and navigate to Libraries. Add your own Google Maps Android API key. Select Run > Run to test the sample app.